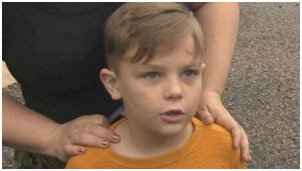 And the most heart-warming story: Seven-year-old Jack Swanson for years has been saving his money to buy an Apple I-Pad. But when the south Texas boy heard about a hate-crime that had vandalized a local mosque, he donated his collection, $20, to the mosque. Faisal Naem, a board member from the Islamic Center of Pflugerville, was so moved by the donation that he responded by sending Jack a new I-Pad, saying the $20 donation felt like a $20 million gift. The debate around Syrian refugees coming to the U.S. has been loud and fierce, and religious communities are stepping forward with a welcome. An interfaith group in Tulsa, Oklahoma is organizing to support Syrian refugees into their community. Religious and community leaders are acting in response to their mayor, Oklahoma’s governor, and a wave of Republican voices calling for Syrians to be kept out of the country. Former Tulsa police chief Drew Diamond said that the core goal should be “to be welcoming and compassionate, and not frightened people who give up our humanity out of fear. After meeting with Indiana Gov. Mike Pence, who would like to ban all Syrian refugees from the state, Archbishop Joseph Tobin reaffirmed that the Archdiocese of Indianapolis will welcome a Syrian family that has been vetted for the past two years. It was a relief, at least symbolically, coming on the heels of Donald Trump’s proposal to shred religious freedom in America by forbidding all Muslims entry. In St. Petersburg, Florida, Mayor Rick Kriseman tweeted that Donald Trump is “barred” from entering St. Petersburg “until we fully understand the dangerous threat posed by all Trumps,” mimicking Trump’s proposal regarding Muslims. Pilgrims on their way to Karbala, Iraq, during Chehlum, commemorating the memory of Imam Hussain – Photo: odishanewsinsight.coIn this Islamophobic atmosphere, it was reassuring to hear that 51 percent of Americans view Muslims as they view any other community, as opposed to 14.6 percent who are fearful of Muslims. In case you’ve been perplexed by some claims about Muslim opinions, solid new statistics show that by large majorities most Muslims around the world have extremely unfavorable opinions of ISIS. Data the Pew Research Center collected in 11 countries with significant Muslim populations, people from Nigeria to Jordan to Indonesia, make their judgment clear.In no country surveyed did more than 15 percent of the population show favorable attitudes toward the Islamic State. And in countries with mixed religious and ethnic populations, negative views of ISIS cut across these lines. The world’s largest annual religious pilgrimage is Muslim, but not the Hajj to Mecca, which draws about two million a year. 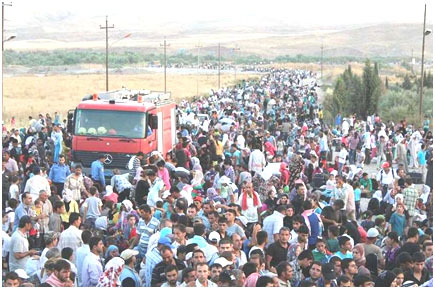 Rather, 20 million were expected to join the “Chehlum” journey, also known as the Arbaeem, earlier this month, walking 50 miles or more to reach Karbala, Iraq. The pilgrimage commemorates and mourns the fortieth day after the death of Imam Hussain, a central figure in Shia history. The annual gathering, resurrected after the death of Saddam Hussain, who had forbidden it, went forward even as the Sunni forces of the Islamic State publically planned to repeat the suicide bombing incidents that marred last year’s pilgrimage. The number of pilgrims in recent years keeps growing, undiminished by war. Meanwhile, the Heritage Foundation, a conservative American think-tank, sponsored a panel of Muslim leaders who think that Muslims need to acknowledge that “Terror is a Muslim issue, an Islamic issue within the house of Islam,” said M. Zuhdi Jasser, “and we must own it” in order to fight and reform it. Reporting for Religion News Service, Cathy Lynn Grossman insightfully notes that “Their stance against literalist interpretation of scripture, their insistence that Muslims take their religion in a progressive direction, and their support for nonpolitical religion, are themes that are also debated among U.S. Christians.” It’s jarring to realize that a conservative outfit like the Heritage Foundation is promoting progressive, liberal religion, but for Muslims, not Christians. On a mournful note, it was reported that a Palestinian poet, Ashraf Fayadh, has been condemned to death for allegedly renouncing the Muslim faith, or apostasy. The court’s judges in Saudi Arabia are Muslim clerics from the Wahabbi sect, one of the most conservative of all Islam’s sects. Saudi Arabia’s vast oil reserves have saved their monarchy from much criticism about Wahabbism’s fundamentalist theology and global proselytism. But that could be changing. Germany’s Vice Chancellor and Economy Minister Sigmar Gabriel has called on Saudi Arabia to quit funding Wahabbi educational programs around the world. Citizens of Iceland pay a government religion tax and have to provide considerable religious information regarding membership, to the increasing annoyance of the public. A new religion has been established, Zuism, based on ancient Sumerian hymns which Zuist leaders say they sing. Zuism promises that anyone over 16 who registers with the new faith will get back their religion tax. Hundreds have signed up, with the government warning them they’ll have to pay taxes on the refund. More than 300 gathered in London on November 17 for a Interfaith Summit during the first National Interfaith Week in the UK. It was organized by the 3 Faiths Forum, a leading interfaith organization in the UK. Panels, lectures, and music and drama presentations were scheduled through the day. “UNFOLLOW - How a Prized Daughter of the Westboro Baptist Church Came to Question its Beliefs” by Adrian Chen should be required reading for anyone involved with interfaith dialogue who has wondered how to deal with “fundamentalists,” people who believe their truth is the only truth. The New Yorker profile of Megan Phelps-Roper may be the most beautiful conversion story you’ve ever read and is full of lessons to be learned.